Ubisoft has unveiled its plan to put a major dent in PC game piracy: Product activations, online authentication and saved games that will be stored remotely on Ubi.com servers. It's not exactly DRM, at least not in the way we've grown accustomed to in recent years. In fact, Ubisoft intends to eliminate some of the most teeth-clenching annoyances of most current DRM schemes: There will be no disc checks and you won't end up with any kind of funky Starforce or SecuROM software installed on your PC. 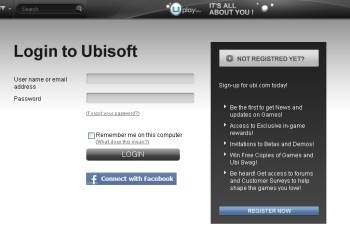 What you'll have to do instead is connect to the internet and your Ubi.com account whenever you want to play a Ubisoft game. The planned scheme won't limit the number of times a game can be installed, according to Brent Wilkinson, the director of customer service and production planning at Ubisoft. "If you own 100 PCs, you can install your games on 100 PCs," he said. And players will have full access to their games virtually anywhere because saved games will be stored on Ubisoft servers, rather than an individual PC. Wilkinson didn't sound too concerned about the possibility that PC gamers might not be happy about having to be connected to the internet full-time in order to play their games. "We think most people are going to be fine with it," he said. "Most people are always connected to an Internet connection." That's a valid point. Ubisoft's planned system also bears a striking resemblance to Steam, a combination DRM and digital distribution platform that's been a runaway success for Valve. But it doesn't sound likely that Ubisoft will allow an offline mode similar to that available with Steam and perhaps even more importantly, the remote save system could be a big sticking point for a lot of gamers. Save files can grow to be pretty beefy in some games, which could be a real problem for dialup users, and if the Ubi servers happen to be down for a few hours your game will be effectively unavailable even if you're allowed to play without authentication. There's still a lot of ground to cover and, one would assume, bugs to work out before the new online setup sees widespread adoption across Ubi's catalog. An early look at it is available through the Settlers 7 beta, which Ubisoft is also using to debut the new copy protection scheme. Beta keys are available now at FilePlanet.